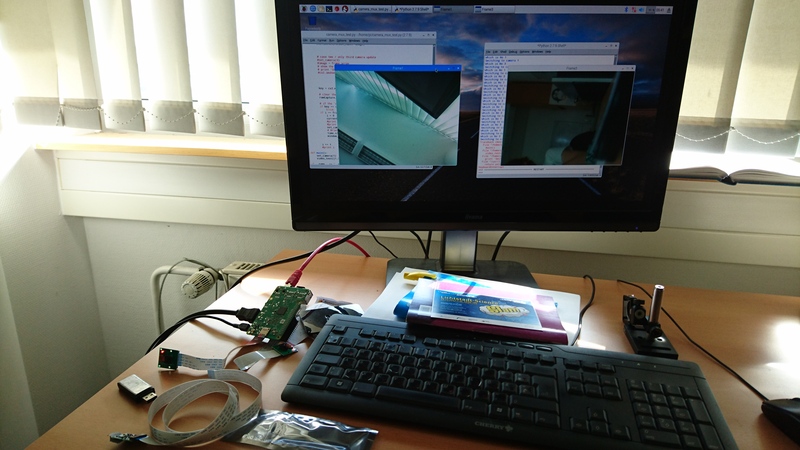 For an experimental setup for our students, I was looking for a cost-effective way to display to cameras on one screen simultaneously. I’ve found the IVPort/Arducam Multicam Adapter here with a github-repository here. Unfortunatelly it was not possible to simply display to camera images on the screen without saving the Jpg first. For one of our experiments we needed this. One camera shows the fourierplane of a lens, where as the other captures the image. After some research, I was able to do this with the help of OpenCV and the PiCamera project. Maybe other could also benefit from this code. Therefore I’ve posted it in a Github Repo. If you’ve any questions, feel free to contact us. I guess there is a format error. Maybe wrong UTF formating or so? Did you try re-identing the code? Do you need further assistance?